Home / Unlabelled / Craftsy's year-end clearance sale! With a new year approaching how would you like to start a new craft project? 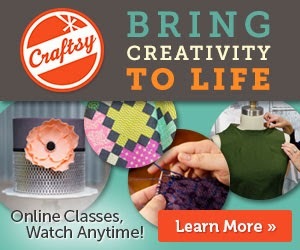 If so then you can get a jump start right now if you Shop Craftsy's Year-End Clearance Sale! Taking up a new craft project or hobby is a great way to relax. You can learn to make your own handmade sweaters, accessories, and more. These would also make wonderful gifts for any occasion. Starting today, you can get up to 65% off all yarn, fabric, and kits. With prices such as these now is a great time to get unleash your creativity. Stock up while supplies last! Offer expires at midnight on December 30th, 2014 at 11:59 PM MT. That is a great deal. Will share this with a friend. I never inherited the crafty gene and wish I had! I love searching clearance to find great deals including craft stuff. I will have to check this out. Thanks so much for sharing. I love doing crafts..